Explore the interrelationships of geography, history, government, and more in one rich package. Provide your students with a consistently riveting narrative flow in a textbook written by an unparalleled author team that includes the world-renowned National Geographic. Enhance reading skills with a program that contains more reading support than any other world history program. Enable students to self-direct learning with StudentWorks™ Plus CD-ROM. The CD-ROM includes student-centered supplements and page-by-page audio of the entire text in English with a Spanish summary. Provide the Student Edition written at a lower reading level with the Reading Essentials and Study Guide. 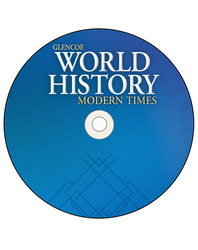 Combined with the world history audio program, the guide is a powerful tool for struggling readers. Ease your lesson planning with TeacherWorks™ CD-ROM. It contains the entire Teacher Edition, all print resources and multimedia, and a built-in lesson plan wizard. Chapter 1 The First Humans, Prehistory–3500 B.C. Chapter 2 Western Asia And Egypt, 3500–500 B.C.